As usual, another super late post, jeesshhh...I've been really late with my posting these days..
O.P.I Mini Nail Polish in #NLE73 Suzi's Hungary AGAIN! For example, this Cacao Natural Soap from Rainforest (review) that was sent to me from Bliss Beauty Collection. I was sent a package of 2 natural soaps and 1 natural body scrub, and I seriously love three of them so much! I even already put the scrub and the other soap into my August Monthly Faves post a while ago. I always love using natural products especially body soaps, and Rainforest is definitely one of my favorite local brand for natural products. This Cacao soap is great for anti-aging properties as well as keeping the skin soft, moist, and helps reduce scars on skin too. After the Etude House set above I also got hooked with this beautiful shade of nail polish by OPI. This is the mini OPI Nail Lacquer in Suzi's Hungary Again! - I believe this one is from the OPI Euro Centrale collection set. I actually have another one in gold shimmers (Oy-Another Polish Joke) that I believe also came from the same set, but that one is a bit gritty when worn. I really like this one instead, the shade is a coral pink that somehow compliment my medium tan skin ;) - if you follow my instagram you must have seen me wearing this beautiful color on my nails. Recently I tried out the very hyped-and-popular Maybelline Color Tattoo Eyeshadows (featured here) that just recently came into Indonesian market. From the first time I tried them on I fell in love completely with them. Mine is in the colors: Bad To The Bronze and Tenacious Teal - which both are super gorgeous vivid colors that I can wear everyday, both for day or night look, without having to worry about them melting on my eyes. The color pigmentation is absolutely amazing and the texture is soft and smooth, I can just use my finger to swipe it and then put it on the lids. I totally recommend these! Another hyped-up makeup items that I just recently tried on and fell in love with are these Revlon Just Bitten Kissable Balm Stain (review coming up). I love these so much I kept on buying another color to collect, LOL. My current favorite shades are Romantic (red shade with orange tint), and Lovesick (a true pink shade). I always love lip colors in pencil/pen/crayon shape like these, and what's even better is we don't have to sharpen this one because they are retractable, so no sharpener needed ;) The colors are amazing, they lasts longer than my other lip stains, and the formula is very comfortable on the lips. It doesn't dry lips because it has moisturizing properties that lasts, and it also leaves a lovely stain after several hours. 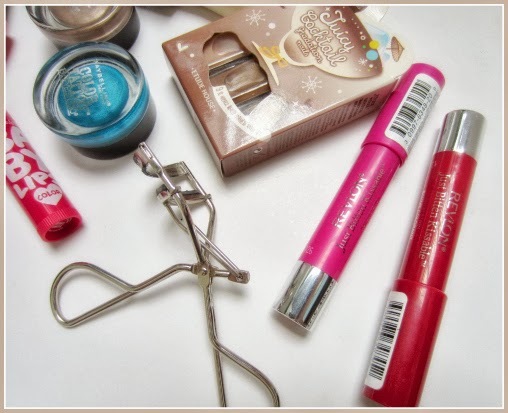 Talking about hyped-up items, an old favorite of mine is the much hyped Shu Uemura Eyelash Curler which has been sitting in my vanity for several years now. It is still one of the best eyelash curler and it is the only eyelash curler that I have been using for years. Of course I have changed the rubber a couple of times since I bought it. 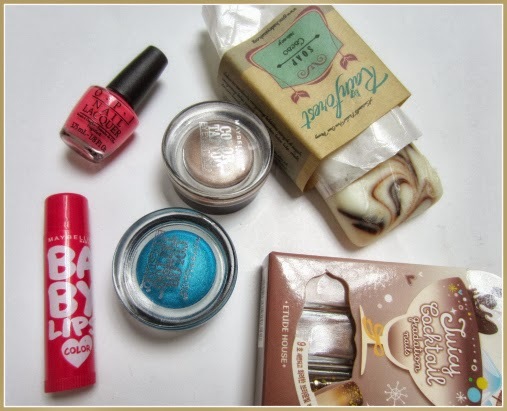 I also like using this after I put on mascara, it lifts up my lashes and curl it up nicely. So have you tried any of the products above? If you have, what did you tried and what do you think of it? 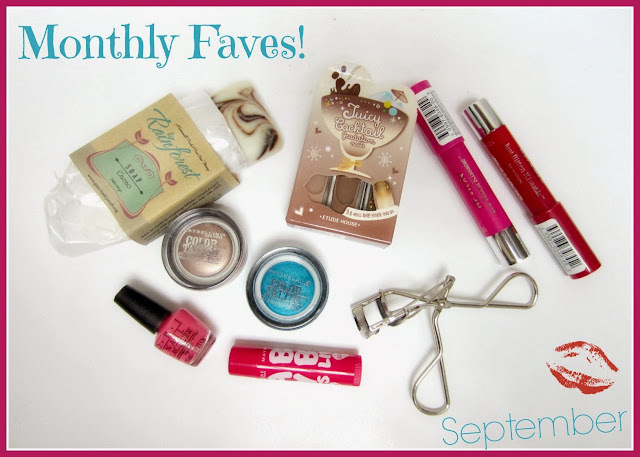 PS: If you like this Monthly Favorite series, you can also check out my previous August Favorites post which you can read here. This Week Lust List !